I posted this lovely card last November to highlight the "reflection card" technique; but, I want to repost it as it uses yet another retiring set, Welcome Christmas. I think this set brings a touch of class and history into an otherwise modern world. 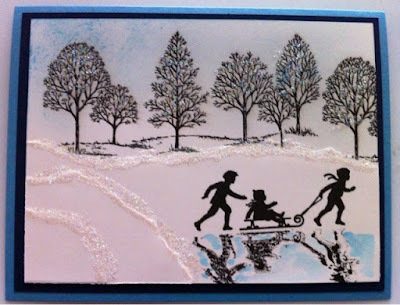 In this card, I've paired it with Lovely as a Tree to create a beautiful winter landscape. If you're like me and love Welcome Christmas, don't let it slip away. Order by May 31 by emailing me or calling 905-320-4477. As always, you can order online 24/7 by clicking my shop now link in the upper right-hand corner. I don't mind at all! Happy Stamping!